Good one Mike. Nice idea. Everything and everybody sometimes needs a little support..
You're phenomenal, Mike, really. I love your mechanical parts, but also the fantastic bark of the tree! Everything is your style and a totally conceivable reality! 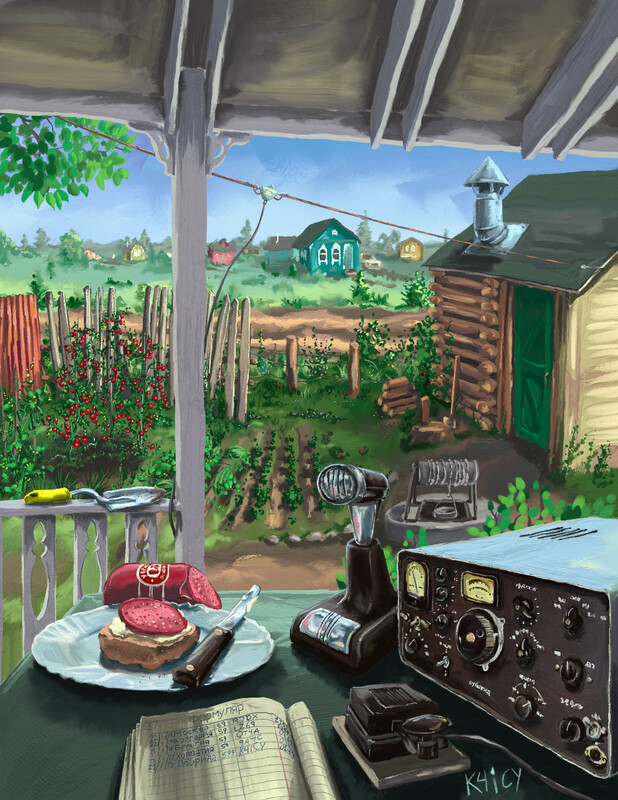 What can make life sweeter than enjoying some time off at your own Russian dacha? Kick back after some gardening with a nice stay in the banya followed by some good international amateur radio conversation. Live the life of a ham-dachnik! So this one was actually done on one layer, and as you can tell by the bad perspectives, this was all done by eye. It's my next radio club newsletter cover of course but I couldn't pass up an opportunity get deep into a Vervation. So it's funny, until I was 30 I lived in (mobile) homes as small as dachas, with gardens and chickens, and etc... though Florida is too hot and humid (lots of bugs) in the summer and a Russian summer home would be a cool relief. http://radio.garden/live/ where you have this globe map and thousands of live streaming radio stations from across the world are represented by little glowing dots. Click on or mover over the dot and the station plays. In between stations you get this static noise to make the experience more interesting. I really suggest each of you giving the globe a spin because it beats those sterile menu lists on iHeart and TuneIn. It's the old shortwave listener in that gets curious about places far away to me. But really, many parts of life are the same and we have more similarities than differences. You know, I think, this has really a special charm! Sometimes the perfect perspective creates a kind of sterility that grabs focus away from the heartfelt expression and attention a painting can bring across. This one totally does it feels like...well..a kind of love and true joy. In a way, I want to say this is one of my favorites of yours! Thing is, if you practice perspective by eye, find your stride in what to "compute" in your minds eye together with what you're looking at, you will develop even greater strength up to a point of near perfection, but it will still contain that human originality. This is partly why I hooked up my little grid cube, which is only meant to aid the process of eyeballing perspective, rather than providing a ruler, you know. It's all a matter of holding on to orientation. Anyway, I love what you've done there! Come to think of it you are right, I found that I was falling in love with this piece and I felt like I wanted to be there to enjoy what I had built and all the serine trappings that come with it. For once, I didn't want to care about perspective and layers, I just wanted to paint and see what I could come up with. Truth be told, the underlying purpose to this piece is kinda a love-letter to the city of Ufa and the beauty of its Russian countryside, yes; an everyday and unassuming city, very much in some ways like the one I live in, but still, it seems to have a spirit to it that beckons. I'm such an artist. Ah Mike, always pleasure to see your art! And great you commented it, very welcomed. Yes, from your picture blows warm breeze and consciousness that we all on Earth are very close together.. ..Hot weather, we are freezing (and my car too) here in the middle EU. Warm thoughts in those cold days telling about an alternative life. But be aware that in this time of the year no one will sit outside for a long time in Russia Not without serious heating of clothings. I've been to Ukraine last year. Anyway, feeling in summertime is somewhat very close to your picture. Knacki, with best wishes for all of us for the next four years. May peace once win over craziness. Don´t worry Knacki, presidents aren´t masters of the world. Neither on west nor on east. Reality will show better way than is presented now..